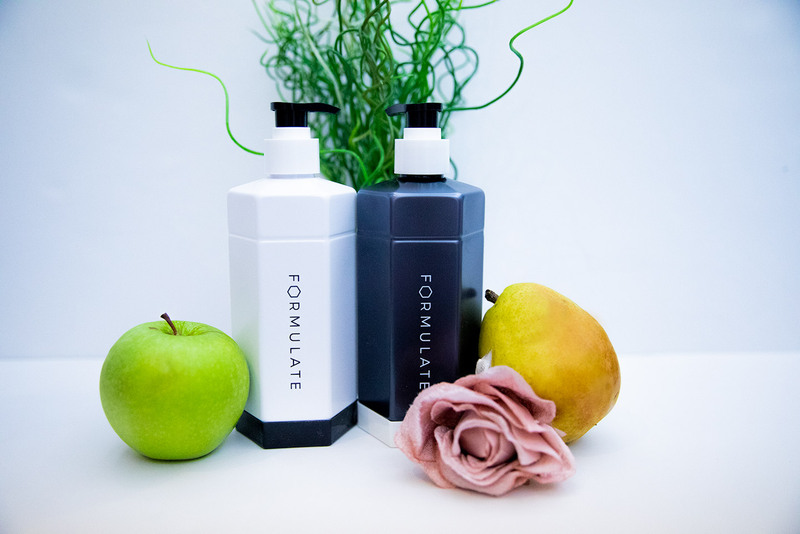 Formulate is a fully customized shampoo and conditioner manufacturer, founded by Osmaan. Osmaan (aka Ooz) is the visionary and coder, Chris – the AI specialist, and Tammy – the chemist and they are quite the team. 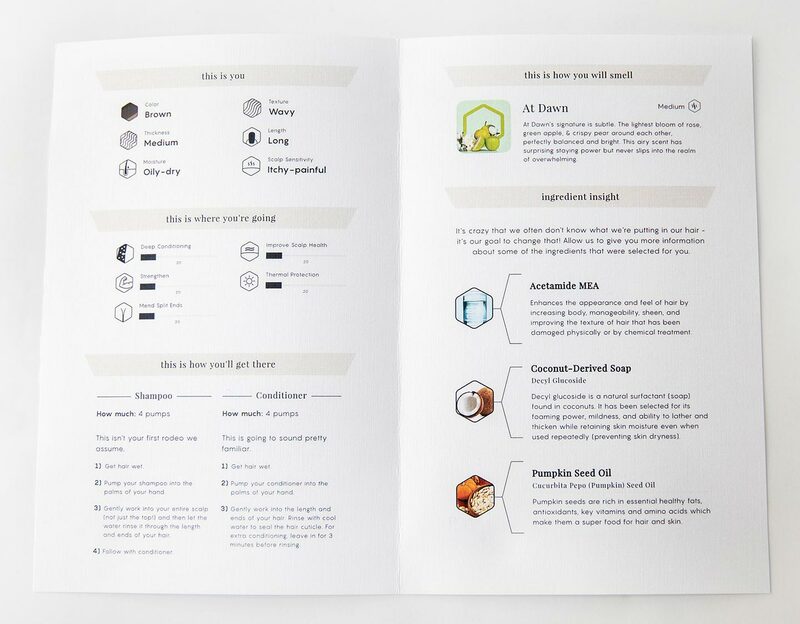 Formulate’s mission is to solve the world’s personal care struggles. 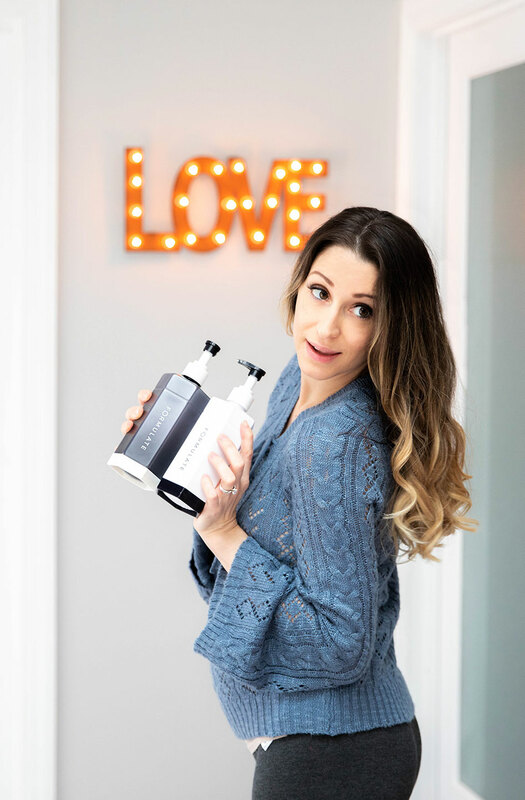 Ushering the “chemist-to-consumer” movement, they have put an end to the guess-and-test process, oversold trend-driven gimmicks, and product waste. 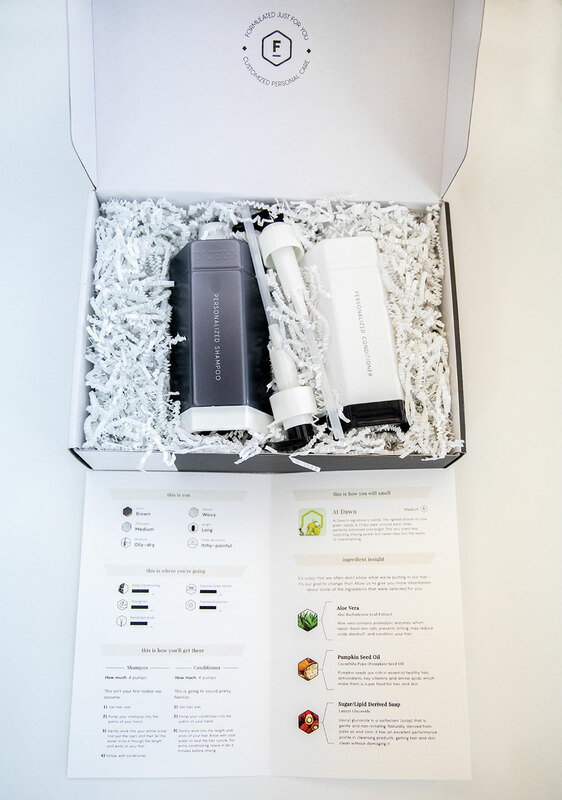 Their goal is to create shampoo and conditioner that is perfectly engineered for you! 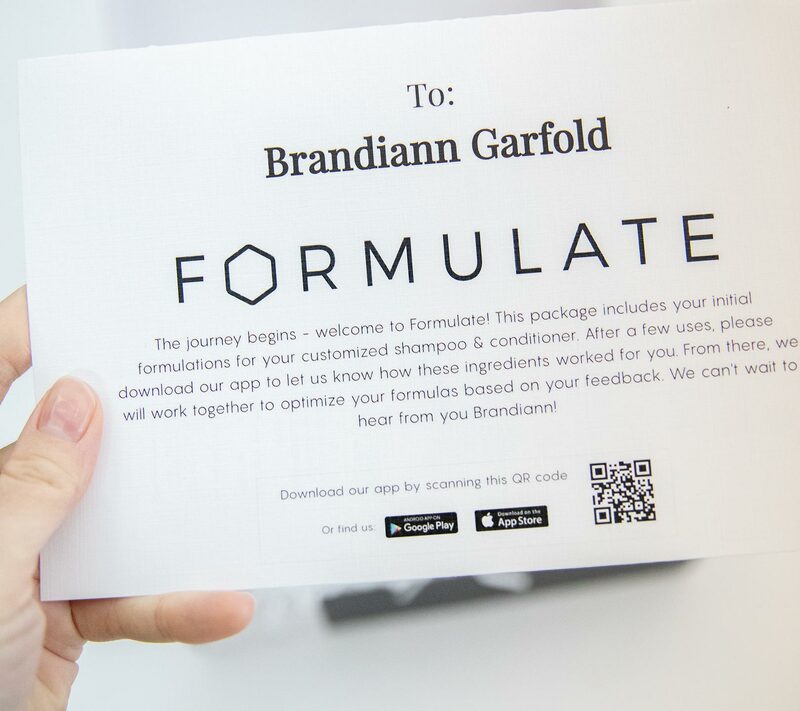 To begin the Formulate experience, you must first download the app (or visit their website.) 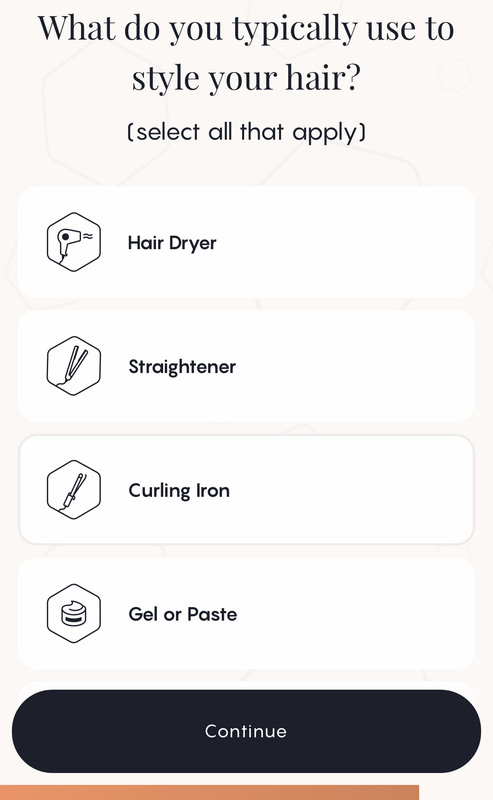 The app walks you through a series of questions about your hair; from color and texture to your overall desired results you want to achieve. 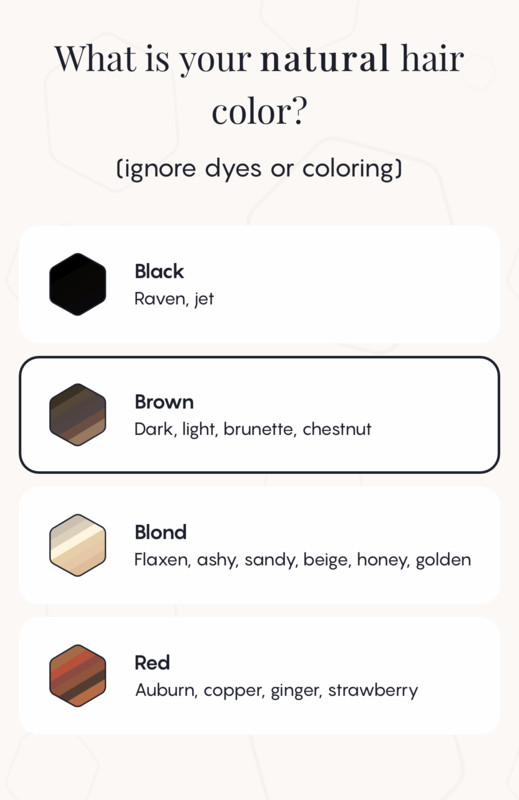 You can also chat with their support team and make any revisions you may need to your fragrance choice and hair goals. 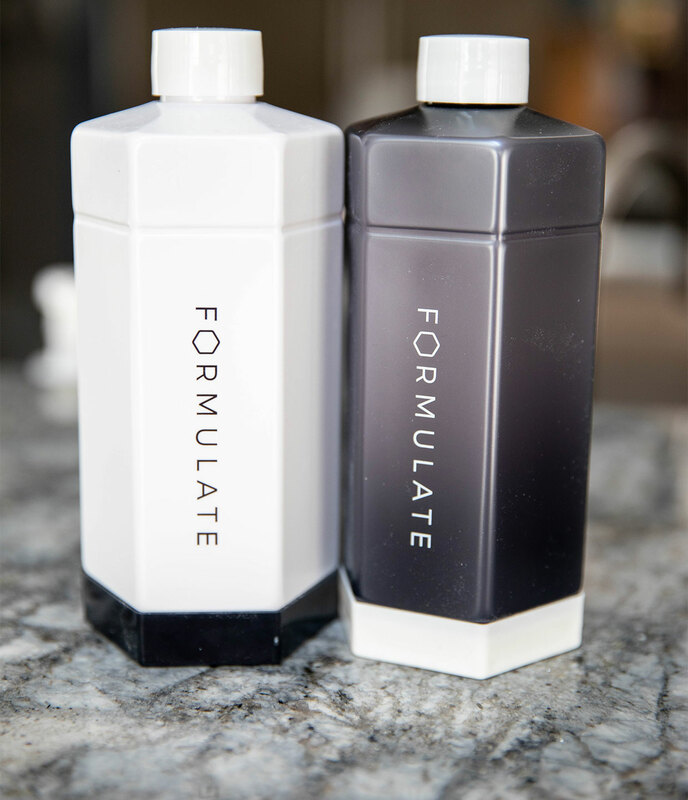 One awesome thing about Formulate, is every bottle is paraben-free, sulfate-free and cruelty-free. This is especially important to me now that I’m pregnant. While there’s no fragrance-free option, their scent selection is excellent. During the scent selection process, they give you the option to choose the strength of the scent, which is great if you’re sensitive to strong fragrances. Check out a few of my answers below, during the questionnaire process. I want to make note that everyone has their own unique experience. What works for me and my hair needs may not be what’s best for you. That’s what makes this company so unique, and an even better reason not to buy your generic cookie-cutter products on store’s shelves. For my first formulation, I chose the “At Dawn” scent, with aromas of rose, green apple and crispy pear. I loved the scent and thought it was the perfect amount, without being overpowering. I couldn’t wait to get started on my hair journey! While showering, I followed the instructions of four pumps of shampoo, followed by four pumps of conditioner. I immediately noticed it felt different than other products, I’ve used before. The conditioner had a sticky feeling, rather than a slippery feeling as if it wasn’t rinsing out entirely. I showered a few extra minutes longer to make sure my hair was rinsed thoroughly. After towel drying my hair, I blew it out and, then straightened it with a flat iron. While blow drying, I noticed my hair still had this sticky feeling – as though I had product residual in my hair, which made it appear greasy. I thought maybe my hair just needed to go through an adjustment period and it would take a few washes. After 2-3 washes, the results stayed the same and I was pretty disappointed. I’m not one to wash my hair every day; more like every other day. My hair felt like it did after a few days of no washing even after I washed it. I knew something wasn’t right! I received an email from the Formulate team checking on my satisfaction level with the product. They had me answer a few questions about the scent, shampoo and conditioner. After answering these questions, they emailed me to let me know their chemist would be tweaking my formula so I would have better results. The chemists were quick! My new shampoo and conditioner arrived in a few short days. I was anxious to see how differently this would feel this time! Like a kid on Christmas morning, I opened my new package and hopped straight in the shower. Immediately, I could feel that the shampoo and conditioner no longer had that “sticky” feeling. When I was done showering, it felt completely washed out! I followed the same steps with my first formulation and blow dried and straightened my hair. The first thing I noticed was a reduction in fly aways and frizz. This new formula was just enough conditioning to tame those issues without being overpowering and greasy. I was thrilled that on the second try they got it right! After looking at the pamphlet, they decreased the amount of conditioning. The ingredients were also different this time around with the exception of one. Overall, I was completely blown away by this company and their products. I truly admire the dedication behind a company that desires to meet each and every one of their customers needs. No matter how many times it takes. I couldn’t tell you how often I’ve purchased hair products only to be completely disappointed, never using them again. Not only is this a huge waste of money, but it also is frustrating. The products get shoved in the closet on the shelf or used as guest shower products. I’m so happy I’ve truly found a company that will find the perfect formula designed just for me! No more waste or guess work – what a huge sigh of relief! A lot has changed since becoming a mother, especially a SAHM. I take pride in my appearance, but it has fallen to the back burner. The kids and house work come first – my makeup and hair last. Many days, I’m rocking the mom bun! Formulate has helped me regain my sense of self with my appearance. My hair smells and feels amazing. I have gotten so many compliments while I’m out. Thank you Formulate for helping me feel beautiful! 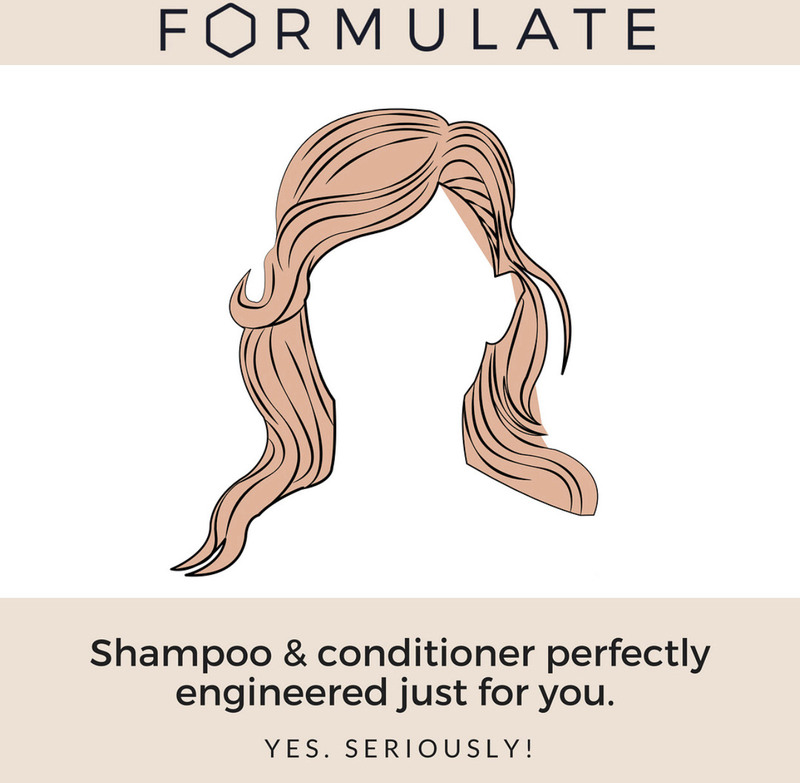 Formulate is kindly offering a pair of shampoo and conditioner for one of you (450 ml each, formulated just for you and for your hair needs and concerns). 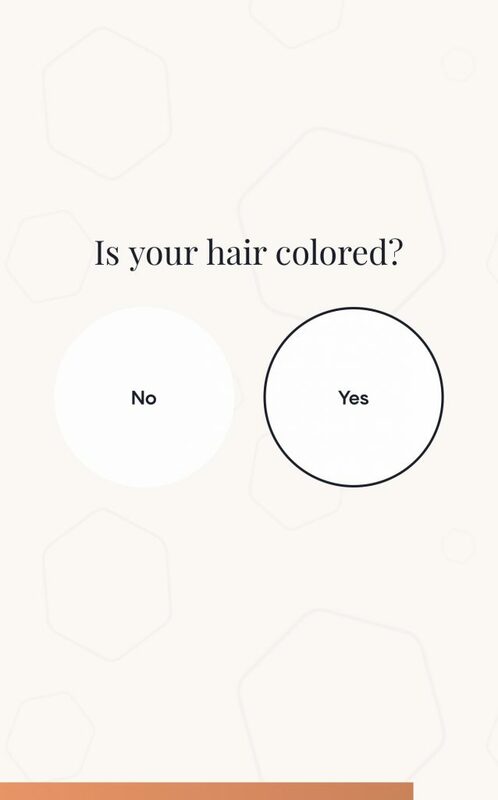 You will be asked choose your scent of choice while you take the ‘hair wizard’ quiz. Thanks so much for reading, and I hope you give Formulate a try. Good luck with the giveaway, everyone! Disclaimer: I was provided with free shampoo & conditioner in exchange for an honest review on my blog. All photos are copyright to MommaReview.com or the Formulate Brand. All views in this review are 100% my own. 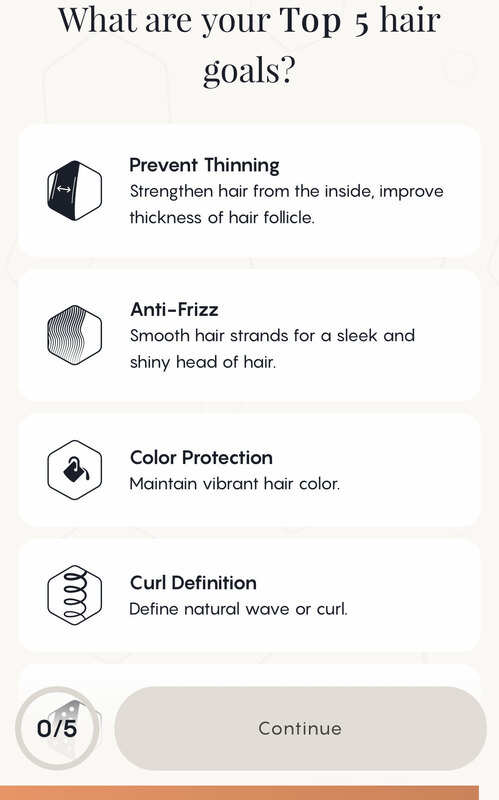 What do you think about the idea behind personalized hair care?